in the gold leaf of His halo. But she cannot take her eyes off us. She cannot take her eyes off us. She avoids looking to the side. the pierce of her gaze. into her eyes, dark as cathedrals. When I first read those powerful lines in Thomas Merton’s poem, “In Memory of the Spanish Poet Frederico García Lorca,” they called to my mind a religious print, “Our Mother of Perpetual Help,” that had hung on the wall of our home when I was a child. Merton’s poem did not, of course, make reference to Mary, mother of Christ, but the images seemed too special and appropriate to her to let them go. In addition to using the lines as a quote to introduce my poem, I borrowed them, the 2nd directly for the 1st line of my poem, and the 1st paraphrased in the last line. I hope that Merton would not have been offended by this. Images of the Virgin Mary, called Theotokos (“Bearer of God”) icons – are of special importance in the Orthodox and Roman Catholic churches. This famous icon, titled Our Lady of Perpetual Help, was painted by an unknown 15th Century Post-Byzantine artist of the Cretan school. The original wooden icon measures 17″ × 21″ inches and is painted on hard nut wood with a gold leaf background. The image depicts the Virgin Mary wearing a dress of dark red, representing the Passion of Jesus, with a blue mantle, representing her perpetual virginity, and cloaked veil, which represents her pure modesty. On the left side is the Archangel Michael, carrying the lance and sponge of the crucifixion of Jesus. On the right is the Archangel Gabriel carrying a 3-bar cross used by Popes at the time and nails. This type of icon is also called a Hodegetria (literally: “She who shows the Way”) composition, where Mary is holding the Child Jesus at her side while pointing to Him as the source of salvation for mankind. 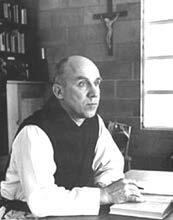 Thomas Merton (1915-1968) was a Trappist monk and one of Catholicism’s most prolific and respected modern apologist authors. Merton wrote more than 70 books, mostly on spirituality, social justice and pacifism; he also wrote many essays, poems and reviews. His best-selling autobiography, The Seven Storey Mountain (1948), was featured in National Review’s list of the 100 best non-fiction books of the 20th century. Another amazing poem. I read Thomas Merton years ago when I was an undergraduate. I need to revisit him. Thanks for sharing this. Thank you, Diane. Merton was a prolific and thought-provoking author.